I was first introduced to Steve Nash and his kids by Shaquille O’neal at the Luxury Expo held at the Stadium in Phoenix Arizona when they both were with the Phoenix Suns 7 years ago. Steve and his kids test drove my Phantom Rolls Royce and were thinking of getting one. Steve and I met again thanks to Director John LaBrucherie on the same “Entourage” episode filmed at Gower Studios in Hollywood 4 years ago. Steve is a total class act, a great father and also a fierce competitive athlete on the court and in my opinion he is a tremendous addition to the Los Angeles Lakers. 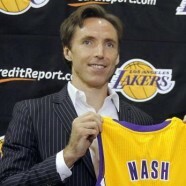 This is going to be an awesome season for the Lakers. Those who mistake his good natured demeanor for weakness, become victims to his speed and seasoned accuracy.